Thar she blows! Whales, Whales and more Whlaes. 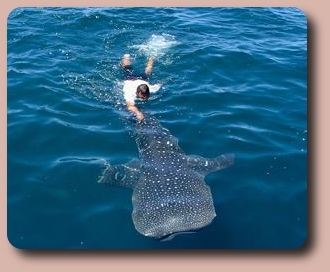 During the Summer we'll head over to Bahia de Los Angeles to swim with the docile Whale Shark. If you're lucky you can actually touch them. No amusement park has this kind of ride. During the Winter months we'll mozy over to the Pacific side to see the gentle Grey Whales and their babys. 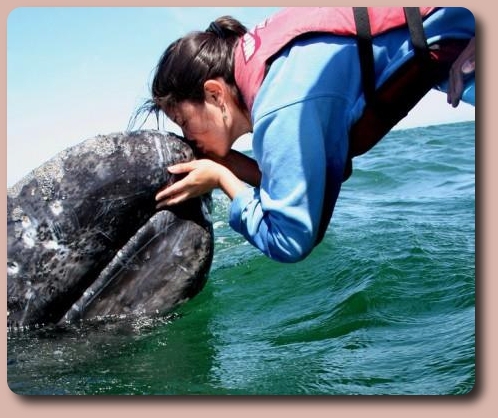 Ever kiss a Whale? It's exhilarating. Swimming and history. It's through the World Heritage site of the awe inspiring Desierto de Vizcaino where we wave "hola" to the famed 3 Virgins Mountains ("Las Tres Virgenes"),impressive volcanic mountains that are over 2054 meters high. San Ignacio here we come; a small desert pueblo in a true water filled desert oasis. Explore the town. The old mission is a must see. Founded in 1728 by the Jesuit Missionarys, it is an architectural marvel. More cave painting anyone? 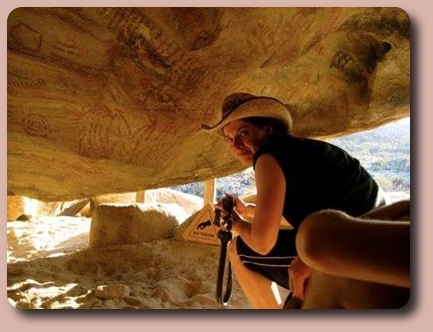 We will visit the World renowned Cochimi Indian's cave painting. The Cochimi are no longer with us but their cave art is. Enjoy! Get ready to rock n' road. We meet up in the morning and meander to Ensenada for lunch and some seaside exploration. 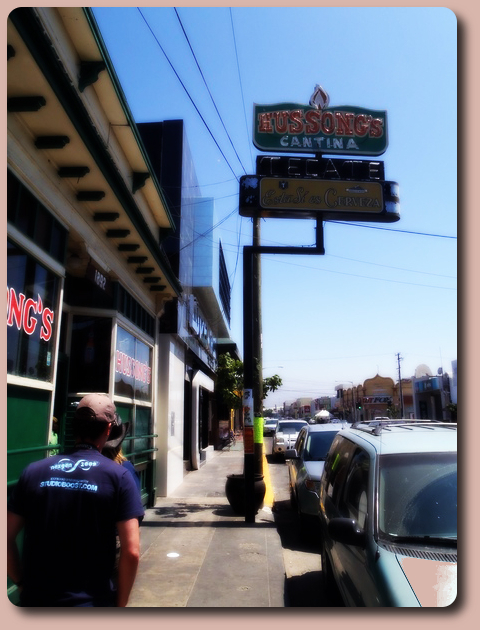 Don't forget to stop in Hussong's Cantina - the oldest bar in the Californias. Then it's a short drive through the wine vineyard to our seaside spot for the evening. Anyone up for some freshly caught lobster? Now we're getting into the sweet spot. Petroglyhs, monster cactus and beautiful rock gardens are the order for the day. The Petroglyphs have been radio carbon dated back 6,000 years. Truly something to behold. The cactus in this area is World famous and is known as the Valle de los Cirios. A must see for anyone. We'll stay at a working ranch in the Valley and marvel at the clear constellations at night. Today we're taking it easy and sliding into Santa Rosalina and the oasis town of Mulege. Santa Rosalina is known for it's French architecture and the famous church created by none other than Gustave Eiffel of Eiffel Tower fame. Get some ice cream and/or hot dogs here. They may be the best in all of Baja. On to Mulege. A Palm Tree covered desert oasis with some great seaside dining. Swim in the fresh water lagoon right into the Sea of Cortez or lay on the beach and perfect that tan. It's the beautiful town of Loreto. Located right on the Sea of Cortez, it is the perfect size town. Walk the picturesque Melicon. Grab a seaside margarita. Did anyone mention more Missions and cave paintings? From here we have the option of hanging in Loreto or checking out the old San Javier Mission and the nearby ancient cave painting. Each is unique in it's own right. Dolphins! It's marine park time Baja style. No aquariums here. This is pure Mother Nature. You'll have the chance to swim with dolphins all you want in the Bahia de Loreto Marine Park. Created from a labor of love by the people of Loreto. It was finally enacted by a Presidential decree in 1996. It has close to 800 species of marine life. Don't cry "Uncle!" We're not done yet. This time it's La Paz and the Island of Espiritu Santo. This area is called the jewel of the Sea of Cortez. Snorkel with the Sea Lions and the hundreds of tropical fish. A nice little jaunt around the island to view the wildlife is priceless. It's time to live it up in the Hotel California and the art galleries of Todos Santos. It's rumored that the U.S. 70's rock band the Eagles came here to write their seminale album "Hotel California" and that the hotel is actually haunted. After a few of their famous margaritas you might believe it! Then it's off to Cabo San Lucas and Land's End and if there's time, a refreshing dip in the local hot springs. After that it's "Adios Mis Amigos" to the La Paz Airport or the Ferry to the Mainland for your next destination with fond memories of new friends and new places discovered.